Samsung Electronics has started mass production of the industry’s first one terabyte embedded , created with 16 stacked layers of NAND flash. This comes just four years after the 128Gbyte Universal Flash Storage (eUFS) chip. 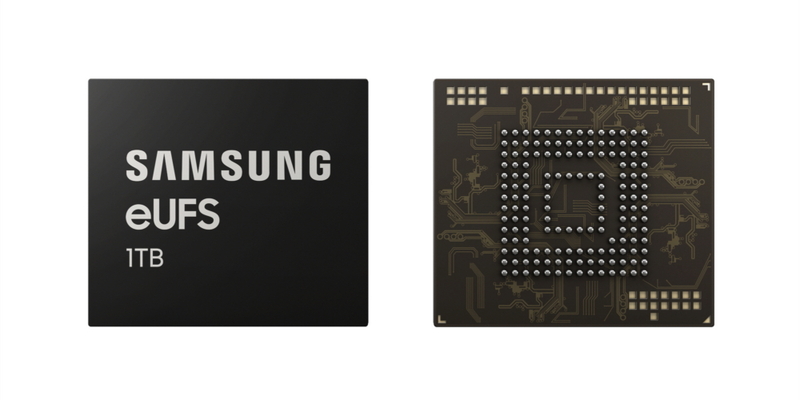 Within the same 11.5mm x 13.0mm package, the 1TB eUFS doubles the capacity of the previous 512GB version by combining 16 stacked layers of Samsung’s most advanced 512Gbit V-NAND flash memory and a newly developed proprietary controller. Smartphone users will now be able to store 260 10-minute videos in 4K UHD (3840×2160) format, whereas the 64GB eUFS widely used in many current high-end smartphones is capable of storing 13 videos of the same size. The 1TB eUFS supports a transfer speed of 1Gbit/s, approximately twice the sequential read speed of a typical 2.5-inch SATA solid state drive (SSD). This means that 5GB-sized full HD videos can be offloaded to an NVMe SSD in five seconds, 10 times the speed of a typical microSD card. The random read speed has also increased by up to 38 percent over the 512GB version, clocking in at up to 58,000 IOPS. Random writes are 500 times faster than a high-performance microSD card (100 IOPS), coming in at up to 50,000 IOPS. The random speeds allow for high-speed continuous shooting at 960 frames per second. Samsung plans to expand the production of its fifth-generation 512Gb V-NAND at its Pyeongtaek plant in Korea throughout the first half of 2019. UrsaLeo, an 'IoT Platform as a Service' technology startup that connects OEMs with the cloud, has launched its beta programme. As a Google Cloud partner, the company has configured cloud-enabled hardware that collects data and delivers dashboards, sensor diagnostics, and data storage management. The company has raised a $500K seed round, which is being used to further develop the IoT and Cloud platform. B2B customers can start using the platform by purchasing a development kit from an UrsaLeo online distributor, Mouser or RS Components. Both companies are currently carrying inventory with kits based on popular embedded processors including the NXP i.MX 6UltraLite (with Murata WiFi/BLE) and the Raspberry Pi 3 Model B+ single board computer. All the kits come with a Silicon Labs Thunderboard Sense 2 carrying ten environmental sensors and are loaded with code for connecting to the UrsaLeo platform and sending data within a few minutes after setup is complete. Users of the Beta platform can work directly with UrsaLeo engineering to add sensors, port the code to their own hardware, and white label the platform for existing and potential customers. Premier Farnell has started shipping the latest version of the Raspberry Pi, the Compute Module 3+. The Raspberry Pi has been very popular in embedded designs and the Module 3+ delivers the enhanced thermal performance and ease of use of Raspberry Pi 3 Model B+ in a smaller form factor, with a choice of memory variants suitable for a broad range of embedded applications including IoT devices and industrial automation, monitoring and control systems. The Compute Module 3+ is based on the Broadcom BCM2837B0 64-bit application processor running at 1.2GHz, with 1GB LPDDR2 SDRAM. Developers can now choose between 8GB, 16GB & 32GB eMMC flash variants and a ‘Lite’ variant, with no eMMC flash, to match their storage requirements. “Customers continue to tell us that it is the ease of use of the Raspberry Pi that makes it so attractive to them when choosing a development board. Over a third of our Raspberry Pi customers are using the board for professional use.” says Hari Kalyanaraman, Global Head of SBC and Emerging Business at Premier Farnell. Raspberry Pi Compute Module 3+ will remain in production until at least January 2024 which is a key consideration for embedded and industrial designs. It is available to buy as a standalone board or as a development kit including a Raspberry Pi Compute Module I/O board, Raspberry Pi CM3+/32GB module, Raspberry Pi CM3+/Lite module, and display and camera adapters. It is available through Farnell element14 in Europe, element14 in APAC and Newark element14 in North America. Silicon Labs has released a software software for its Wireless Gecko chips to add Bluetooth 5.1 positioning for the Internet of Things (IoT). The new feature supports multiple methods for determining signal direction including angle-of-arrival (AoA) and angle-of-departure (AoD), and Silicon Labs’ implementation of the new Bluetooth feature enables detection of signal direction within 5 degrees. To date, Bluetooth asset tracking and indoor positioning solutions have typically provided location accuracy within a range of 3-4 meters. With the Bluetooth 5.1 update developers can create products that improve location accuracy down to the sub-1-meter level, opening the door to applications previously not possible. Silicon Labs’ direction finding software, including support for the AoA method, is available today to selected customers through the Silicon Labs Simplicity Studio. Chemists at the University of St Andrews in Scotland have developed a new version of the periodic table which highlights the scarcity of elements used in electronic devices and batteries. 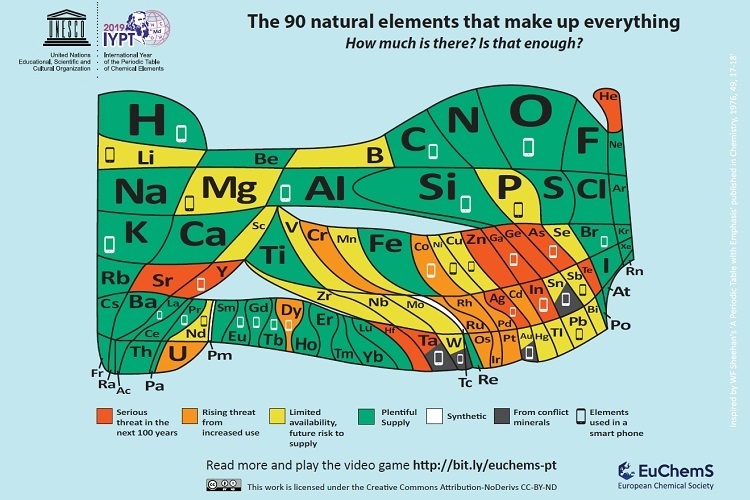 The European Chemical Society (EuChemS) worked with researchers at St Andrews to highlight the remaining availability of all 90 elements and their vulnerabilities, including sourcing from areas of conflict. The availability of around 15 elements is a challenge because of limited supplies, their location in conflict areas, or the current inability to fully recycle them. The table highlights threats to the supply of gallium, arsenic zinc and even silver, as well as the rising problems for the supply of cobalt, lithium and platinum. “It is astonishing that everything in the world is made from just 90 building blocks, the 90 naturally occurring chemical elements. There is a finite amount of each and we are using some so fast that they will be dissipated around the world in less than 100 years," said Professor David Cole-Hamilton, emeritus professor of chemistry at St Andrews. 2019 is the United Nations International Year of the Periodic Table (IYPT2019) and the 150th anniversary of scientist Dmitri Mendeleev’s description of the periodic system. The electronics industry hit a key milestone last year shipping over 1 trillion devices. 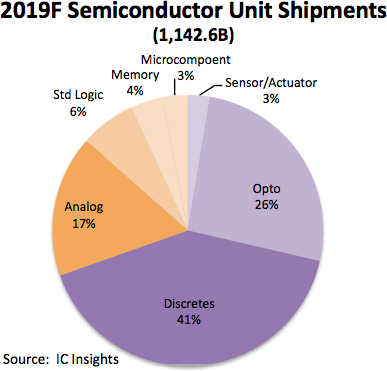 Annual semiconductor unit shipments, including integrated circuits and optoelectronics, sensors, and discrete (O-S-D) devices grew 10% in 2018 to reach 1,068.2 billion units according to the 2019 edition of IC Insights’ McClean Report. Shipments are expected to climb to 1,142.6 billion in 2019, which equates to 7% growth for the year. Starting in 1978 with 32.6 billion units and going through 2019, the compound annual growth rate for semiconductor units is forecast to be 9.1%, a very impressive growth figure over 40 years given the cyclical and often volatile nature of the semiconductor industry. The percentage split of total semiconductor shipments is forecast to remain heavily weighted toward O-S-D devices in 2019 (Figure 2). O-S-D devices are forecast to account for 70% of total semiconductor units compared to 30% for ICs. This percentage split has remained fairly steady over the years. In 1980, O-S-D devices accounted for 78% of semiconductor units and ICs represented 22%. Many of the semiconductor categories forecast to have the strongest unit growth rates in 2019 are those that are essential building-blocks for smartphones, automotive electronics systems, and devices that are used in computing systems essential to artificial intelligence, “big data,” and deep learning applications. In a surprise move, the European arm of tyre maker Bridgestone is to buy the telematics business of satnav maker Tomtom for €910 million in cash. The telematics business was seen as a key area for growth for Tomtom with the growth of the Internet of THings (IoT) and connected vehicles. TomTom Telematics is a leading provider of technology to fleets, handling over 800m GPS data points every day from over 860,000 vehicles making 3.3 million trip and sending 200 million inbound messages. Tomtom will use the money to focus on its map business. The new combination will allow Bridgestone to cross-sell tyres to a larger customer base but the value is that the data access will enhance Bridgestone’s virtual tyre development and testing as well as connected tyre innovation benefiting all customers including OEMs. Bridgestone sees mobile digital tech for fleets of vehicles as a strategic priority. This is reinforced by the growing importance of fleets over individually-owned vehicles for transportation of people and goods. Increasing demand in the transportation industry means that fleet owners and managers need to maximise productivity and minimise total cost of ownership more than ever. This latest investment builds on previous work at Bridgestone to strengthen its digital capabilities in Europe, building capabilities in data collection from sensors, data platforms and analytics. This has resulted in the launch of a range of digital solutions and applications such as Tirematics, Mobox, FleetPulse and Bridgestone Connect. TomTom Telematics has an installed user base of 860,000 vehicles of which more than two thirds are commercial, managed by the WebFleet and NextFleet platforms. Its strong underlying technologies based on data analytics rely on an open, scalable, secure and cloud-based platform. The platform enables customers such as commercial fleets, leasing companies or corporate fleets to make their operations more efficient. It also enables partnerships such as with OEMs because of the improved driver experience. Bridgestone brings its R&D and Rome-based Digital Garage dedicated to the development of digital mobility solutions. The transaction is anticipated to be completed latest in the second quarter of 2019. Renesas Electronics has launched a Failure Detection e-AI Solution for motor-equipped home appliances using the Renesas RX66T 32-bit microcontroller (MCU). The embedded AI (e-AI) enables failure detection of home appliances -- such as refrigerators, air conditioners, and washing machines -- due to motor abnormality. Data on the motor’s current or rotation rate status can be used directly for abnormality detection, making it possible to implement both motor control and e-AI–based abnormality detection with a single microcontroller. Using the RX66T eliminates the need for additional sensors, thereby reducing a customer’s bill of materials (BOM) cost. The new solution uses the Renesas Motor Control Evaluation System and an RX66T CPU card. This hardware is combined with a set of sample program files that run on the RX66T MCU as well as a GUI tool that enables collecting and analyzing property data indicating motor states. In order to detect faults, it is necessary to learn the characteristics of the normal state. Using the GUI tool, system engineers can immediately begin developing AI learning and optimized fault detection functionality. Once the AI models are developed, the e-AI development environment (composed of an e-AI Translator, e-AI Checker, and e-AI Importer) can be easily used to import the learned AI models into the RX66T. The chief executive of HPE has poured scorn on quantum computing and doubled down on its Memory driven architecture as the future of computing. "We now find ourselves on a precipice, where the near future will bring with it a wealth of possibilities. The potential of what’s on the horizon of computing is something truly remarkable. However, this immense potential brings with it significant challenges – and it is our responsibility to do everything in our power to overcome them," said Antonio Neri, President and CEO of HPE. "New emerging technologies could be the tools we need to flourish as a society. At HPE, we aim to harness the transformative power of these technologies to achieve our purpose – to advance the way people live and work. Only then can we start to unlock our technological potential," he said. The main roadblock on this journey to a better world lies in the limitations of conventional computing solutions, he says, especially with the impact of the data generated by the Internet of Things (IoT). "There is a growing data deluge as our ambitions grow faster than our computers improve. Every two years we create more data than has ever been created before, with the majority of it originating at the edge, or the periphery of the network," he said. "We need a new paradigm that reinvents the most basic functions of a computing system from the ground up. Memory-Driven Computing is one approach that delivers an entirely new way of computing specifically designed for the Big Data era," he points out. Doubling down on the commitment, he says: "Only through a new architecture like Memory-Driven Computing will it be possible to simultaneously work with every digital health record of every person on earth, every trip of Google’s autonomous vehicles and every data set from space exploration all at the same time – getting to answers and uncovering new opportunities at unprecedented speeds." He is negative about quantum computing, where HPE has been not been investing significantly in R&D, although it is at the leading edge of research in quantum cryptography. "Quantum computing is one component that is in the global spotlight at the moment. Undeniably quantum computers will be able to achieve some amazing things, like the discovery of new drugs and materials. So rightly, organisations are exploring this technology. But as a society we can’t rely on quantum computers as the sole solution because quantum computing only solves quantum problems," said Neri. "For instance, quantum computers can’t analyse and derive insights from the massive amount of sensor data our society is producing – from factories and connected cars to airports and security infrastructure. And quantum systems require a tremendous amount of energy." However machine learning has been demonstrated on quantum computing systems (see the work by Regetti , link below), highlighting the ability to identify patterns in IoT data. "As the complexity of the demands we place on computers increases, so too does our need for customised solutions, built for the problem at hand," said Neri. "A holistic view of future challenges combined with a new type of computing will allow for tailored solutions to some of the most significant problems facing our world. The challenges we’re facing are not insurmountable, and for governments and businesses around the world, the question is how to best prepare to meet these challenges head-on and succeed." CommAgility in the UK has teamed up with Aricent, a global design and engineering company that is part of the French Altran group, to develop 4G eNodeB solutions for Network Equipment Providers (NEPs). THe same deal will lead to pre-integrated 5G solutions. The current eNodeB small cell basestation designs will be based on the KeyStone II digital signal processors with CommAgility’s PHY software, which delivers a complete LTE Physical Layer for macro cells. Aricent is supplying the L2 and l3 layers of software. Having a complete solution will help operators boost the capacity of 4G networks to provide more coverage for cellular IoT networks, significantly reducing development costs and mitigate risks to launch LTE eNodeB products to market faster. “CommAgility is one of the leading PHY software developers for Texas Instruments SoCs, backed up by expert support and worldwide presence. With CommAgility as eco-system partner for PHY software on the TI platform, we have been able to create pre-integrated LTE eNodeB solutions that exceed the requirements of network equipment manufacturers, and we look forward to creating pre-integrated SoC based 5G solution,” said N. Mohan Rangan, Chief Engineering Officer at Aricent. The SmallCellPHY software is available in two variants – as a Reference Chain, and a version for Texas Instruments’ small cell SoCs. Compliant with 3GPP standards, it is entirely software-defined, to increase flexibility and scalability. SmallCellPHY is optimised for low memory, processing power, and power consumption, and provides innovative algorithms such as advanced scheduling. Market researcher GlobalData has revealed its top trends for 2019 across the technology, media and telecoms (TMT) industry. The company’s latest thematic research report analyses the major trends impacting companies across 15 TMT sectors. While many of these trends are specific to individual sectors, there are several broad themes that we track every day at the Embedded blog. “In 2019 companies should ensure they are tracking the relevant themes, as companies who invest in the right themes become success stories; those who miss the big themes end up as failures. Given that so many themes are disruptive, it is very easy to be blindsided by industry outsiders who invade your sector,” said Cyrus Mewawalla, Head of Thematic Research at GlobalData. • China’s influence on the global TMT industry will growChina’s growing influence across every segment of the technology sector is not an accident, but an intrinsic part of the country’s strategic plan. The Chinese government has made clear its desire to lead globally in AI and has also invested significantly in other emerging technologies such as 5G. At the same time, the country’s leading technology companies are emerging as major forces on the global stage, with the likes of Alibaba and Huawei expanding their international presence. Consequently, companies in all TMT sectors should be watching developments in China very closely. The global market for 5G chips is expected to grow from $2,120.0 million in 2020 to $22,929.0 million by 2026, an annual CAGR growth of 48.7%, says a report from Allied Allied Market Research. Asia-Pacific is expected to dominate the market, followed by North America. In 2020, the US is expected to dominate the North America market and Germany is expected to lead the overall market in Europe. In Asia-Pacific, China is expected to dominate the market. Proliferation of M2M/IoT connections and increase in demand for mobile broadband services drive the growth of the market. However, high investment and technological and infrastructure challenges in the implementation of 5G network and privacy and security concern impedes this growth. In the near future, rise in government initiatives for building smart cities in the Asia-Pacific is expected to create lucrative opportunities for the key players operating in this market. A new standard to move the LON protocol to IP could help to boost building and industrial automation systems. The ANSI/CTA 709.7 LON IP protocol, recently approved by the American National Standards Institute (ANSI), will speed further adoption of LON technology and continue to expand the LonWorks ecosystem, says Adesto Technologies. The new standard enables native LON communication over any IP transport such as Ethernet and Wi-Fi, as well as interoperability with IP-based web services so that building and industrial automation systems can seamlessly and securely interoperate with cloud and IoT applications. Adesto acquired LON developer Echelon last year and worked with other LonMark International (http://www.lonmark.org) members to drive development and standardization of the new protocol, which describes the complete set of requirements for users, developers, vendors, integrators and specifiers of open building and industrial control systems to develop LON devices with native IP transport. As building and industrial control networks must handle ever-expanding datasets and additional IoT application interfaces, IP communications can provide higher speeds, greater bandwidth and increased flexibility. LON IP builds on the device management and control services of the LON technology implemented in over 150 million devices over the years across all critical industrial markets including building automation, smart grid, lighting controls, transportation and manufacturing equipment. 8bit controllers are still widely used, and ST has added a range of features to its STM8L050 range that starts at $0.25. The STM8L series adds a four channel, 12bit ADC, a DMA controller, and separated data EEPROM, all in an inexpensive SO-8 package with up to six user I/Os for a 16MHz core. The devices are aimed at industrial sensors, toys, access cards, e-bike controllers, home-automation or lighting products, smart printer cartridges, or battery chargers. The integrated DMA (Direct Memory Access) controller speeds application performance by streamlining data transfers between peripherals and memory, or from memory to memory, ultimately saving power consumption. The 256 bytes of separated EEPROM allows applications to store important program data when the MCU is powered down, while allowing maximum use of Flash for code storage. Alongside two comparators, the STM8L050 has a 4-channel 12-bit analogue-to-digital converter (ADC) and a low-power real-time clock (RTC) with programmable alarm and periodic wakeups, allowing designers to minimise external analogue components. In addition, support for either an external or internal clock at up to 16MHz further enhances flexibility to balance performance with bill-of-materials (BOM) savings. The STM8L050 has power-saving modes that cut current to as little as 350nA, and operates over a wide voltage range from 3.6V down to 1.8V. The MCUs are fully specified from -40°C to 125°C, ensuring robustness and reliability in demanding applications such as industrial controls or lighting products. A study by Gemalto has shown that only around half (48%) of businesses can detect if any of their IoT devices suffers a breach. While spending on protection has grown (from 11% of IoT budget in 2017 to 13% now) and nearly all (90%) believing it is a big consideration for customers, the survey of 950 IT and business decision makers globally showed significant problems. Gemalto found that companies are calling on governments to intervene, with 79% asking for more robust guidelines on IoT security, and 59% seeking clarification on who is responsible for protecting IoT. Despite the fact that many governments have already enacted or announced the introduction of regulations specific to IoT security, most (95%) businesses believe there should be uniform regulations in place, a finding that is echoed by consumers - 95% expect IoT devices to be governed by security regulations. Businesses are calling for governmental intervention because of the challenges they see in securing connected devices and IoT services. This is particularly mentioned for data privacy (38%) and the collection of large amounts of data (34%). Protecting an increasing amount of data is proving an issue, with only three in five (59%) of those using IoT and spending on IoT security, admitting they encrypt all of their data. Consumers believe security needs to improve (62%), followed by privacy concerns (54%), control of devices by hackers (51%) and lack of control over personal data (50%). Gemalto sees blockchain emerging as a potential technology; adoption of blockchain has doubled from 9% to 19% in the last 12 months, with a quarter (23%) of respondents believe that blockchain technology would be an ideal solution to use for securing IoT devices, with 91% of organisations that don’t currently use the technology are likely to consider it in the future. Blockchain capacity to secure IoT is somewhat overestimated, she says, as the technology by definition has nothing to do with many popular attack vectors on IoT devices. GDPR's role is also questioned, as most of the careless IoT manufactures are located far beyond EU jurisdiction and do not care about any judicial decisions of European courts against them. Moreover, not every IoT is designed to store or process PII, thus making GDPR simply inapplicable. “Uniform regulation of the IoT market is a Utopia amid current geopolitical tensions in the technology sector. Nonetheless, governmental regulation of secure-by-design IoT is certainly a good idea and probably is the only way to make the IoT market more reliable,” she said. STMicroelectronics has launched a dual radio development kit that combines Bluetooth Low Energy (BLE) and Sub-1GHz wireless. The STEVAL-FKI001V1 kit is aimed at the development of smart-home or smart-building systems as well as asset-tracking, energy-management, smart-farming and industrial monitoring and control use cases with the BlueNRG-1 Bluetooth 5 System-on-Chip and S2-LP sub-1GHz transceiver. The dual-radio architecture enables simultaneous operations on a variety of radio-frequency bands and protocols such as Bluetooth LE or proprietary 2.4GHz, Sub-1GHz, and Sigfox. The kit helps developers create smart objects that connect to each other locally through mesh or point-to-point connections and support flexible ways of connecting to the Cloud. For instance, a convenient sensor ecosystem for smart-home could be easily forged with local sensor networking leveraging either BLE or Sub-1GHz wireless link and the whole system connected to the Cloud through a local gateway or directly via a seamless Sigfox ubiquitous link, for surveillance or remote monitoring purposes – all based on same STEVAL-FKI001V1 kit. The BlueNRG-1 ensures convenient setup, configuration or modification of device settings during installation or maintenance and permits monitoring of networked node sensors through a stylish app running on any Android or iOS device. The sub-1GHz S2-LP transceiver allows local networking as well as LPWAN installations including global Sigfox connectivity, which allows capabilities such as real-time notification of events. Moreover, users can leverage out-of-the-box Sigfox-ready networking to track and remotely localise devices or assets. The STEVAL-FKI001V1 development kit is also fully interoperable with the recently announced BlueNRG-Tile board, to build end-to-end smart-sensor solutions including the sensor node, local gateways and global Cloud connectivity. 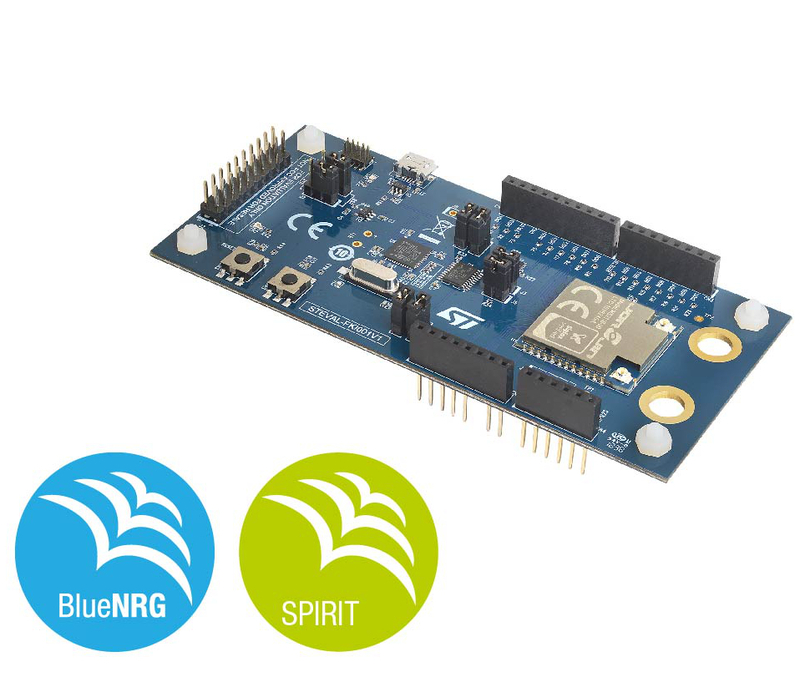 The BlueNRG-1 SoC’s Arm Cortex-M0 core has 256KB of embedded program memory to add external sensors and process the data acquired locally in real-time. The STEVAL-FKI001V1 comes with an easy-to-use SDK that simplifies development and compresses time-to-market while preserving flexibility, scalability, and extensibility. It could also be used in conjunction with the ST BlueNRG-Mesh software package to create extensive networking on a large-scale installation. OTA firmware update is possible via the BLE connection. The STEVAL-FKI001V1 development kit is available now from ST distributors, or directly through st.com, priced $56.00. Adesto Technologies has teamed up with IBM to combine the Watson AI platform with Echelon networking for predictive energy analysis in smart buildings. 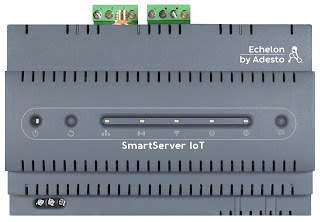 Echelon has been selling its Open Embedded IoT Platform into the building automation and energy management industry for over two decades, and Adesto’s SmartServer IoT edge server platform (https://www.echelon.com/products/smartserver-iot ) provides built-in device and data management for sensors, meters, actuators and controllers in buildings, through various emerging and traditional protocols including BACnet, LonWorks, Modbus, and others. The Watson IoT Platform enables organisations to capture and explore data for devices, equipment, and machines, and discover insights that can drive better decision-making. IBM Tririga Building Insights is built on the Watson IoT Platform and uses AI analytics to surface building inefficiencies without the need for dedicated data scientists. 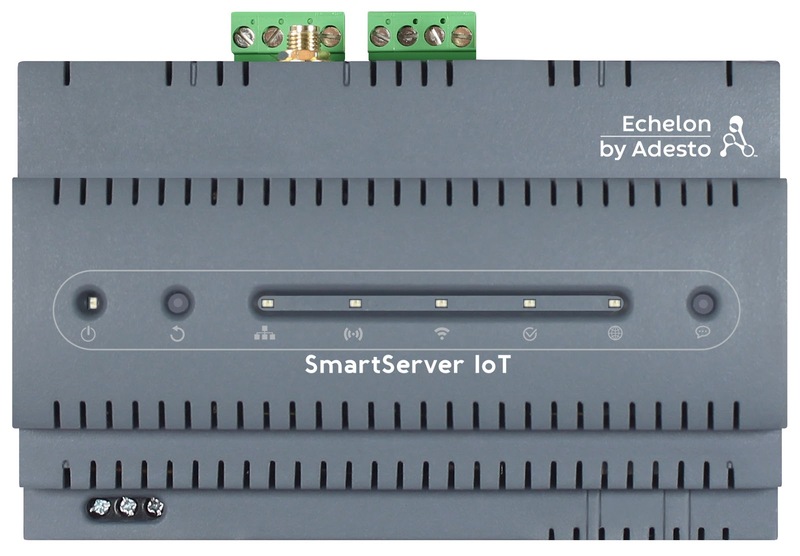 The powerful capabilities of the IBM Watson IoT platform combined with the seamless connectivity of rich data from Adesto’s SmartServer IoT can provide facility managers with deep insights into energy consumption and other operational aspects of a building. 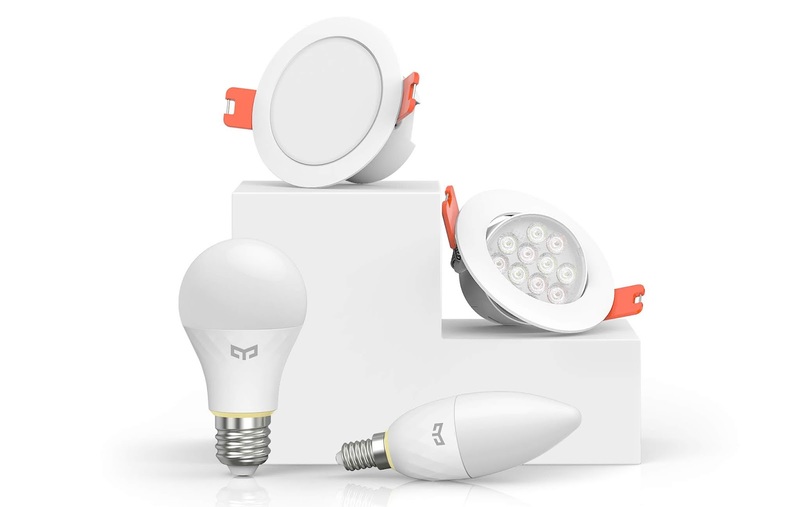 Chinese smartphone maker Xiaomi has launched a range of smart home products using Bluetooth mesh technology from Silicon Labs. 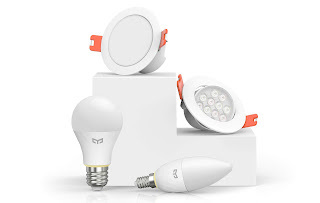 SiLabs' EFR32BG Wireless Gecko RF and microcontrollers are being used for smart LED light bulbs, candle bulbs, downlights and spotlights. The voice-assistant XiaoAi smart alarm clock serves as a gateway to control smart Bluetooth mesh lights through voice commands. Silicon Labs has shipped more than 150 million mesh networking SoCs to date after its acquisition of Energy Micro. Chip designer ARM is branching out into the retail market with a full software stack that enables retailers to securely consolidate, unify and manage their previously separate digital customer data and physical in-store IoT data. The move highlights the increasing importance of a full stack up into the cloud sitting on a particular chip architecture (which is currently Intel, of course). The data management system combines ARM's Pelion IoT and Treasure Data Customer Data Platform (CDP) to help retailers break down data silos and obtain a holistic view of a shopper’s path to purchase. The key is collecting customer data and in-store IoT data and making this accessible to the right stakeholders. The software runs across a huge range of IoT devices. It comes from display advertising, email, web, mobile and more by including physical in-store IoT and POS data from the CDP platform, and then links to Pelion IoT to provide data management of real-time data in-store and API-enabled integration for digital maps, beacons, computer vision and store execution software. The stack seamlessly integrates with retailers’ existing systems and software, including those from ARM partner Reflexis, whose store execution software is used by more than 250 retailers globally. The Reflexis ONE platform then brings an additional layer of value by providing retail store associates with actionable tasks based on real-time data insights from the stack. For example, data captured from a shopper's engagement with a product in-store and their online shopping behaviour can trigger an alert in Reflexis ONE on potential interest in the product, areas to provide better customer service and opportunities to deliver a personalised offer so that the store associate can prioritise their tasks. Our partnership with Reflexis minimises the costs of change management and will allow retailers to quickly deploy the solution in stores and train store associates. It's not a typical story for the Embedded blog, but identifying network congestion is a key challenge around the world, particularly in airports. Many airports are operating beyond their maximum capacity due to the growing number of passengers and cargoes. Measures are being taken to alleviate congestion, such as increasing the number of staff on ground or expanding airports. However, understanding human behaviour and the actions people take depending on their attributes and information given is a key challenge to tackle. Professor Shingo Takahashi of the Department of Industrial and Management Systems Engineering at Waseda University and Fujitsu Laboratories developed a new technology that automatically analyses the factors leading to congestion based on the results of human behaviour simulations. Conventionally this analysis uses the results of large numbers of congestion prediction simulations to try and find the root cause of congestion, but this overlooks potential causes due to human error from time to time and required the simulations to be evaluated one by one, which sometimes took several months. "The new technology groups categories that have a certain degree of commonality, and expresses the characteristics of respective agents (which represents a diverse group of people) in a small number of combination categories without listing the results of movements and routes of tens or hundreds of thousands of agents individually through simulation-based modelling," said Professor Takahashi. "This makes it easier to discover the cause of congestion and answer the question of what sort of measures can be taken to change the mindset or actions of people with specific sets of attributes in a matter of just few minutes." Takahashi and Fujitsu applied this technology to a simulation at a local airport in Japan. They discovered approximately four times as many causes of congestion in comparison to analysis by experts. In an analysis of congestion at security screening, the system found that passengers lining up at a specific check-in counter caused sudden congestion. The measures implemented according to the findings of the technology reduced the number of people waiting in line by one sixth than the measures proposed by experts. Additionally, the number of staff required to implement the measure was reduced by two thirds. This technology enables a quick evaluation of measures to ameliorate congestion in commercial facilities, event venues and other locations that deal with congestion due to high attendance or urban centralisation as well. The work has significant implications for the Internet of Things, linking to digital signage. Fujitsu will also use its Human Centric AI Zinrai artificial intelligence and supercomputer technologies, and together with its Fujitsu Technical Computing Solution Citywide Surveillance software, which enables a real-time understanding of urban conditions. These will be used to develop a future predictive solution for congestion.